Jesus Christ! What did I almost submit to?!? … These last few weeks have been vitally revealing in the same way as my summer employment of a year ago. I learned then that I cannot endure white collar work, + that I could not count on being able to get along after college, reading, writing, etc., and with any job to give me enough money to live. 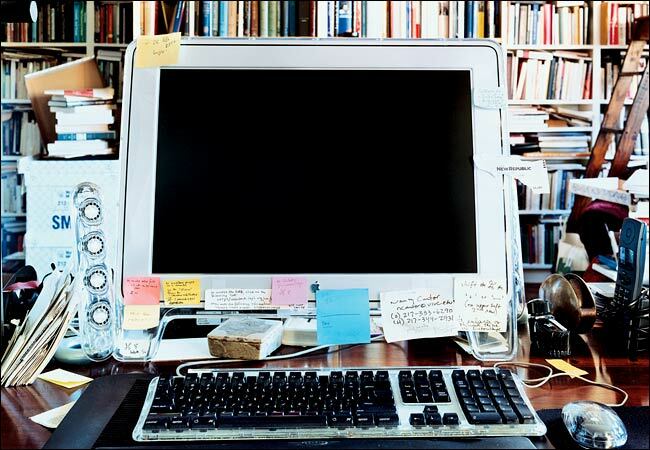 (I had naively supposed that it was better to do something meaningless than something pseudo-intellectual, i.e., teaching – I did not realize how apathetic, drained one becomes by the activity of most of one’s working hours.) That eliminated one-half of my aspirations toward proletarian living, + my present manner of physical existence has stripped off the other half of my illusion! Each of us has known such creatures, whom Walter Benjamin defines as “crepuscular” and incomplete, similar to the gandharvas of the Indian sages, who are half celestial genie, half demon. “None has a firm place in the world, or firm, inalienable outlines. There is not one that is not either rising or falling, none that is not trading its qualities with its enemies or neighbor; none that has not completed its period of time and yet is unripe, none that is not deeply exhausted and yet is only at the beginning of a long existence.” More intelligent and gifted than our other friends, always intent on notions and projects for which they seem to have all the necessary virtues, they still do not succeed in finishing anything and are generally idle [senz’ opera]. They embody the type of eternal student or swindler who ages badly and who must be left behind in the end, even if it is against our wishes. And yet something about them, an inconclusive geture, an unforeseen grace, a certain mathematical boldness in judgment and taste, a certain air of nimbleness in their limbs or words – all these features indicate that they belong to a complementary world and allude to a lost citizenship or inviolable elsewhere. In this sense, they give us help, even though we can’t quite tell what sort of help it is. It could consist precisely in the fact that they cannot be helped, or in their stubborn insistence that “there is nothing to be done for us.” For that very reason, we know, in the end, that we have somehow betrayed them. Forgive me, Jane Dark, but I am going to repost your entire post from tonight, all of it, even the picture, and then add a couple of comments. From the annals of Anglophilia, this fantasia from the estimable Enid Starkie. Gathering momentum as it goes, it consigns Baudelaire’s talent to the paternalistic mercies so redolent of Empire, with an easy confidence that, had he only been heir to such management strategies, he could really have had a chance to straighten up and fly right, never doubting the desirability of this imagined outcome, a kind of starched quasi-achievement which is invested with more and more libidinal force with each clause before collapsing back down to the fleshpots of Paris. In England Baudelaire, at this stage of his life, would have gone to either Oxford or Cambridge, as an undergraduate, where, under proctorial and tutorial supervision, he would have done himself no permanent harm. He would probably have made a name for himself in undergraduate circles, in artistic and literary clubs, and this might have satisfied his need for eccentric self-expression. In this simple and adolescent manner he would have grown out of his ‘green-sickness’, and, under tutorial pressure, might even have learned to work at set hours, in order to pass his examinations. It is, however, probable that he would have been a serious student, for, with his facility and felicity in Greek and Latin, he might have been a Balliol Scholar, and have read with distinction for Honour Moderations, while his taste for metaphysical and philosophical argument might have led him finally to Greats. But, in whatever manner he chose to spend his time, he would have been kept under kindly supervision during these critical years. Unfortunately the university system in France does not fulfil the same function as it does in England, and the life into which artistic and literary young men and plunged, on leaving school, is the Bohemian life of the Latin Quarter, the life of cafés, literary circles and student balls. 1) OK. 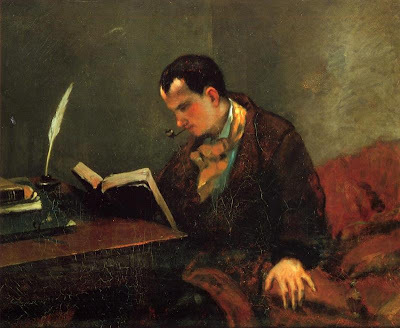 When I clicked into the post in my rss reader, upon seeing nothing more than the portrait of Baudelaire by Courbet, it took only a second or two for me to realize, for the realization to surface, that I recognized the face. Not as Baudelaire’s, but as my own. The likeness really is uncanny – that’s me, my head photoshopped onto the fuzzy period wear. Me at 21, 22, 23. Not that long ago. The high brow, my hair wasn’t often cut that short but sometimes, yes. The beardlessness, no stubble even. Yep. I smoke cigarettes, not a pipe, and never (anymore) inside… If you read this blog and you know me in person, feel free to chime in. Am I crazy? That’s me, there, isn’t it? My nose has perhaps a bit more hook, and is slightly less bulbous at the tip. But the eyes – yes, just so. The mouth – exactly. 2) Unfortunately, damningly, however spitting the first image, the one in prose, Starkie’s rendition of the poete maudit domesticated fostered by, well, the tremendous support system that is the well-run anglo university, the portrait of the english Baudelaire puts the Courbet to shame in (pre)figuring yours truly.